We’d love your help. 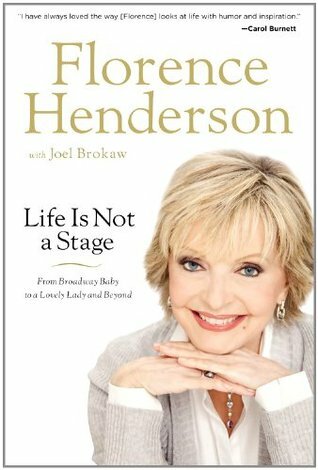 Let us know what’s wrong with this preview of Life Is Not a Stage by Florence Henderson. Florence's father was a dirt-poor tobacco tenant farmer who was nea For millions of people around the world, Carol Brady is synonymous with motherhood, but growing up as the youngest of ten children in rural Indiana in the aftermath of the Great Depression, Florence Henderson lived a life quite different from that of the quintessential TV mom she later played on television. Florence's father was a dirt-poor tobacco tenant farmer who was nearly fifty years old when he married Florence's twenty-five-year-old mother and was nearly seventy when Florence was born. Florence's childhood was full of deprivation and abandonment. Her father was an alcoholic at a time when there was no rehab or help for the disease. Their home rarely had electricity or running water. When she was twelve, Florence's mother left the family to work in Cleveland and never returned. To ask other readers questions about Life Is Not a Stage, please sign up. Really fun and interesting. I had a very distinct image of who Florence Henderson was in my mind and in certain ways I was absolutely right but in many I was completely off. This is a fast read and very well written (although sometimes the time line is a little hard to follow) and completely enjoyable. I read an advance copy- it will be out in September. I recommend if you are at all a fan. Recommends it for: Fans of Florence Henderson. Recommended to Dawn by: I enjoy Autobiographies. I picked up this book because The Brady Bunch is one of my favorite TV shows. I thought I would skim those parts, look at the photos and that's it. But no! The book was so good from start to finish -- with Florence explaining how her rough childhood impacted her as an adult, balancing motherhood (with 4 kids), a marriage and working, and sharing inspiring things about her Catholic faith. This is one of the best autobiographies I've read in a long time. I picked this book up mostly to read about Florence Henderson's experience with The Brady Bunch. For the most part I enjoyed reading about her personal and professional life before and beyond. I thought it was a decently written biography. There were things that bothered me. From the Introduction she called herself a victim and I felt like she had a "victim" mentality. Several times she blamed choices that she made later in her life on the "abuses" she endured as a child. First, I'm a firm belie I picked this book up mostly to read about Florence Henderson's experience with The Brady Bunch. For the most part I enjoyed reading about her personal and professional life before and beyond. I thought it was a decently written biography. There were things that bothered me. From the Introduction she called herself a victim and I felt like she had a "victim" mentality. Several times she blamed choices that she made later in her life on the "abuses" she endured as a child. First, I'm a firm believer in the "survivor" mentality and the whole "bad childhood, great life" thing. Also, perhaps it was the way she wrote about her experiences, but her "abuses" didn't really seem as traumatic and horrific as she tried to make them sound. Another thing I didn't like was when she said that her mother was "courageous" for finally getting up the nerve to leave when Florence was just 12 years old. I'm sorry, but I can't really think of any situation where leaving your children behind and moving on with your own life separately is a "courageous" decision. And call me a prude, but I found it incredibly sad that she held to her Catholic morals and beliefs well into her adulthood, even remaining a virgin until her wedding night, only to have a SLEW of adulterous affairs in her 30's. She spoke kindly and highly of her ex-husband, but truly her actions spoke louder than words. She's obviously had no respect for him or the sanctity of marriage. You may be surprised that this woman, best-known for her role as a cheerful, handle-it-all mother of a large blended family grew up in an abusive home, the youngest of ten children. In short, Carol Brady was the kind of mother Florence Henderson desperately wished she had. She left home at seventeen, suitcase in hand, with a one-way ticket to New York City and a life full of hope. She had a talent for singing and a desire to be on the stage. Her destination? The American Academy of Dramatic Arts. Taming her complex accent of southern drawl and mid-western twang was an essential part of her early acting lessons. She writes fondly of her singing and acting training and admits that learning how to portray sad feelings was a challenge. Auditioning for her first role, a rite of passage for any actor, gave her a break. She joined the cast of Wish You Were Here and subsequently signed with an agent. Soon she landed the lead role in a tour of Oklahoma. Her television career launched when she became the first “Today Show Girl.” She claims the famous television series, The Brady Bunch, was a small part of her list of credits. Read to the book to hear her account of other triumphs. Personal and professional photos grace the middle of the book. The book is peppered with names of greats Henderson worked with—Rodgers and Hammerstein, David Merrick and Ed Sullivan. Henderson opens up on her personal life. Stardom and its impact on her family are discussed. She speaks freely of marriage, motherhood, extra-marital affairs, depression and spiritual questioning. Her glass-half-full personality kept her optimistic during the worst of times. Even though the scars from her childhood haunt her, she says that voicing them in this book has helped her to heal. Carol Burnett, a dear friend, says, "I have always loved the way she looks at life with humor and inspiration. This book proves that in spades!" Miss Henderson’s spirit is what triumphs in this memoir. Amidst the triumphs and chaos of a public life, she was able to create a life full of joy and purpose. “Be grateful and forgiving.” That is sage advice from a celebrity who has lived life on many levels. Hatchette Book Group graciously supplied the review copy for my unbiased review. Does anyone really see the person behind the movie star? Florence Henderson was iconic in her T.V. show years, but how many people actually knew her as Florence rather than, say, Carol Brady? She has a very diverse and complicated background. The reader will get to read a little about her mother and father, how different they were and the problems Florence faced as a young child. She endured abuse and abandonment...described with a fair amount of detail in the book. The reader will immediately l Does anyone really see the person behind the movie star? Florence Henderson was iconic in her T.V. show years, but how many people actually knew her as Florence rather than, say, Carol Brady? She has a very diverse and complicated background. The reader will get to read a little about her mother and father, how different they were and the problems Florence faced as a young child. She endured abuse and abandonment...described with a fair amount of detail in the book. The reader will immediately like Florence as a person and be drawn into the book. The book is very factual, it doesn't feel as if the author is attempting to sway the reader to a certain side or way of thinking. Florence makes it to her adult years, where more trouble lies in wait for her. She also has plenty of good events occur to even out the bad. The reader will likely find him/herself more interested in Florence's life rather than her movie star years. She will become just a person with an interesting story to the reader, the reader will think of her as Florence rather than Carol. This book is very well-written and recommended to adults/young adults who enjoy nonfiction. Her autobiography is a decent read....it seems she puts more emphasis on the beginning of her life and how she got into show business eventually getting the roles in different plays and untimately getting role of the matriarch of the Brady clan...but there is so much more. Her latter life is touched on but without the detail you find from the first half of her life. Florence Henderson is quite a person and since her young years has always been an uplifting and vibrant person. The book was very interesting. Biographies are interesting in that they give me a perspective into how I lacked something or how I may incorporate something good into my life. On the other hand some biographies teach you how not to be the ungrateful living dead, like "Hitler". Hooray for those who help themselves and try to uplift others with them. I thoroughly enjoyed this book. While it wasn't an account of Florence's painful childhood, it was a relfection of her life as an adult, forging in her career and her personal life, despite some personal obstacles! This book is a testament to faith, courage and perseverance in breaking free from your emotional troubles. I really enjoyed reading about Florence's life. It was honest and inspiring. It wasn't a typical "rags to riches", stardom autobiography! I liked it very much. It was written with a clear, comfortable style that made me want to finish it. I originally planned to just read the "Brady Bunch" parts but got hooked by her hard working Midwest demeanor and was glad that she didn't spend more time than was necessary on that part of her life and career. An interesting book about an interesting woman. 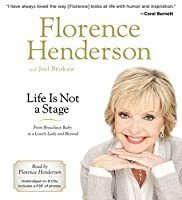 There's more to Florence Henderson than Mrs. Brady, and she doesn't pull any punches in this autobiography. What I liked about the book was learning about the other career achievements Henderson made - besides the obvious role in the Brady Bunch. What a talented lady! I was particularly surprised to learn that she was the first female guest host of The Tonight Show. Clearly her humor was intrinsic and not projected through that show, which is what I had always assumed. What I did not like about the book was its random, very minor details. I don't need to know about the first time you felt the erection What I liked about the book was learning about the other career achievements Henderson made - besides the obvious role in the Brady Bunch. What a talented lady! I was particularly surprised to learn that she was the first female guest host of The Tonight Show. Clearly her humor was intrinsic and not projected through that show, which is what I had always assumed. Interesting. This one was recommended by Matt’s grandma. I don’t think I’ve ever seen a full episode of The Brady Bunch but I have seen reruns just flipping through channels. I would not want an actress’s life - too much auditioning, traveling and self-care involved. She's definitely not an author, but it was interesting to read about her early life, and learn that she already had a major stage career before she became forever known as Mrs. Brady. Good insight on an American icon. Very interesting to know more about Mrs. Brady. I loved the Brady Bunch growing up...so I was looking forward to reading Florence Henderson's memoir. Not disappointed. This lady was so much more than Brady Bunch. Good easy read. Great read about a lovely lady that you feel like you already know from her work on tv. Disappointed, it was very bland. I didn’t love this book. This was a really fun and interesting read! Florence seemed to be different than other “famous” people. You’ll have to read it to see what I mean. This isn't a book a normally would have picked up on my own. But since I won a copy of the book, I was quite excited to read it. Not completely knowing what to expect this it, I wound up really pleasantly surprised. I was expecting to read quite a bit more about life filming The Brady Bunch, but now that I've read Florence's story I understand it. There are really only a chapter or two about the show, which really doesn't seem like a lot considering that's want she's know for. But what I had no i This isn't a book a normally would have picked up on my own. But since I won a copy of the book, I was quite excited to read it. Not completely knowing what to expect this it, I wound up really pleasantly surprised. I was expecting to read quite a bit more about life filming The Brady Bunch, but now that I've read Florence's story I understand it. There are really only a chapter or two about the show, which really doesn't seem like a lot considering that's want she's know for. But what I had no idea about was how much else she had done, that while Mrs. Brady is her claim-to-fame it was in no way her big break. Florence early on says she won't be talking much about her childhood, but even so she does paint the basic picture. Her mother was in her mid-twenties and her father almost fifty. Florence was the last of 10 children born in the mid-1930s after 20 years of her parents marriage. Her father was a poor tobacco farm and an alcoholic, and her mother left the family when Florence was around 10-years-old. After high school she left her hometown in Indiana to move to New York hoping for her big break. It wasn't long after that she was cast chorus of a play, and went on to be a Broadway star staring in plays such as Oklahoma and The Sound of Music. She did start in a movie or two and helped to host The Today Show all before her time as Mrs. Brady. Before reading this I had no idea of Florence's musical background, although I guess it shouldn't really have been a surprise. She does disclose of few "scandals" throughout the books pages, but if that's all you're looking for you're probably be disappointed. But overall it wound up being an enjoyable book, and I'm glad I was able to experience and would definitely recommend. I will readily admit that I knew Florence Henderson from her iconic role as Carol Brady and nothing else. I certainly had no clue she had such an astounding career both before and after The Brady Bunch! I realized pretty quickly that Florence's life was interesting in its own right, and since I knew nothing about her, every revelation was a surprise. She seems like a good person and admits her own shortcomings and faults with what seems like genuine insight. I went into this book expecting a ton I will readily admit that I knew Florence Henderson from her iconic role as Carol Brady and nothing else. I certainly had no clue she had such an astounding career both before and after The Brady Bunch! I went into this book expecting a ton of chapters devoted to the Brady Bunch but that was certainly not the case. I believe there was only one chapter, and it basically just skimmed the surface and addressed the Barry Williams rumor and that's about it. Had I known this subject would be so minimal going in, I would probably not have read this book so I'm glad I didn't know. Ultimately this was a good and interesting read but definitely not a juicy one. I enjoyed it because I enjoyed her voice, and I was very interested in her life on Broadway (I've always been fascinated with the theater). Being a true fan of anything Brady, I was captivated by this book cover while at the library. I was inspired by Florence's gumption, perseverance and determination to rise above her troubled childhood to pursue her dream of singing and dancing, despite the many challenges and pressures that these dreams entailed. I appreciated the forthright way in which she addressed her mistakes of her past and their consequences and how she reflected on the lessons learned. She is an amazingly optimistic pers Being a true fan of anything Brady, I was captivated by this book cover while at the library. I was inspired by Florence's gumption, perseverance and determination to rise above her troubled childhood to pursue her dream of singing and dancing, despite the many challenges and pressures that these dreams entailed. I appreciated the forthright way in which she addressed her mistakes of her past and their consequences and how she reflected on the lessons learned. She is an amazingly optimistic person throughout the book, striving to see the glass half full. It was also refreshing to read that she has answered and continues to answer every fan letter and email that she receives, and does not hesitate to take pictures with fans or sign autographs. It was great to discover that she had performed so much before her Carol Brady days, and continued to be in high demand as an entertainer following the end of the Brady episodes.